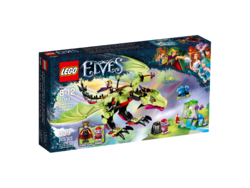 41183 The Goblin King's Evil Dragon is an Elves set released in 2017. Includes a Goblin King mini-doll figure, plus Ashwing the earth dragon, Jimblin the Goblin, Blubeary and Lil’ Blu. Ashwing features posable wings, wing claws that can grip, and space for the Goblin King and Jimblin, plus a cage for crystals. Also includes a crystal cave with space on the side for Blubeary and Lil’ Blu, and an explosion function to reveal the crystal Hide Lil’ Blu in the secret spot in the cave. Capture Blubeary the momma bear in Ashwing’s claw. Send Jimblin with instructions to blow up the cave and recover the crystals. Pack the crystal in the cage on Ashwing’s back and fly away. Accessory elements include a crystal, cage, dynamite, berries, instruction tile and the Goblin King’s magic staff. This set offers an age-appropriate build and play experience for ages 8-12. 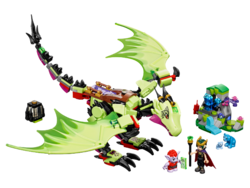 Other mischievous goblins can be collected in select LEGO® Elves sets Ashwing measures over 4” (12cm) high and 12” (31cm) long, with a wingspan of 14” (38cm). Crystal cave measures over 2” (6cm) high, 3” (8cm) wide and 1” (5cm) deep. Facts about "41183 The Goblin King's Evil Dragon"